Those swinging, singing sisters, Liz and Ann, in their new concert show, Broadway with the Callaways (at the Sony Concert Hall), brought screams of cheers to the theater district last night (March 25), the kind that usually emanate from across the street, where Hamilton plays. However, on this dark Monday night those waves of passionate enthusiasm, with the audience standing on its feet song after song, were for these two tremendous talents who saluted Broadway with power, intelligence and pitch-perfect stylings out of the Great American Songbook. If some songs were hilariously funny, some contained just the right touch of sadness. The blend was as unique and true as their voices. It’s amazing how different are Ann and Liz as singers, though they offer harmonies that make their sound effortlessly beautiful. Performing in New York with an updated version of a show they last performed three years ago, this one-night only, sold out event made all of us feel privileged to have been in attendance. Putting all my cards on the table, I have been a fan of Liz Callaway’s since even before her career on the stage began in earnest. She and I, along with a dozen other young actors, were cast back in 1981 in a CBS-TV film called Senior Trip, which told a bunch of stories about a high school class from Youngstown, Ohio coming to New York City for fun and adventures. I, at twenty-four, was cast as an eighteen-year-old; but Liz was the real deal: fresh out of high school and already on her way, having just been cast for a fall production of a new Broadway musical called Merrily We Roll Along, the latest Stephen Sondheim/Hal Prince musical. Liz would sing two songs in Senior Trip (which were not by Sondheim), one of which I got to watch as she performed it on the stage of Broadway’s Mark Hellinger Theatre from around midnight till 7 a.m., while the rest of the city was sleeping. The only person in the audience was Mickey Rooney (playing himself), who starring in Sugar Babies at the time. It was only two years later that Liz would find herself nominated for a Tony Award for her role in Baby, where she thrilled audiences with her rendition of “The Story Goes On,” which she did once again last night. As for Ann, Liz’s older sister, it was she who first came to New York from their hometown of Chicago to seek fame and fortune. The pair soon found themselves in their own private revival of Wonderful Town. Two sisters dreaming of success in a city they would come to call home. As Ann recalled last night, “I was five foot ten and worth the climb,” but had to settle for “being born forty and will always be forty!” Happily, she found her true calling as a jazz vocalist, piano player, arranger and songwriter, and has been at it ever since (even finding her way to Broadway and a Tony nomination of her very own for 1999’s Swing). No strangers to performing together, as anyone familiar with their 1995 album Sibling Revelry knows, it’s simply magical how powerful Ann and Liz’s combined singing can be. Then, as now, the arrangements were by Alex Rybeck, who as musical director was brilliantly backed by Jered Egan on bass and Ron Tierno on drums at Sony Hall. The evening, directed by Dan Foster, was exceptionally well-thought out, giving us Broadway highlights that included solos for Ann from Funny Girl and Mame; and for Liz from Dear Evan Hansen and A Chorus Line (and how often do you get to see “Music and the Mirror” performed without a mirror?). 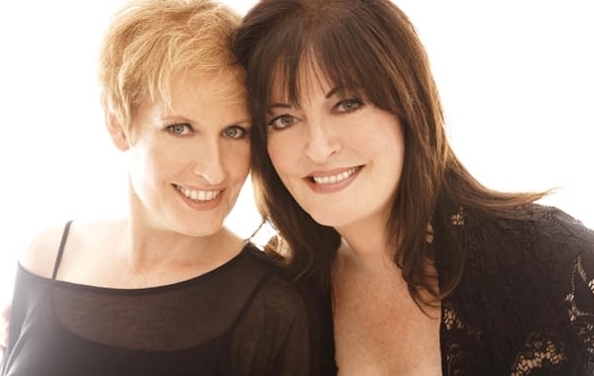 But it is when Ann Hampton Callaway and Liz Callaway blend their voices in such magnificent ways that it makes their combined efforts an amazing two-of-a-kind experience. And though it may be equally thrilling to see them live in their individual cabaret shows, I sincerely hope they won’t stay away too long from the concert stage as a duo, even if they run the risk of giving the audience too much of a good thing. Broadway With the Callaways took place March 25 in New York City at Sony Concert Hall (235 West 46th Street, between Seventh and Eighth Avenues).